Confessions of a 20-something Scrapbooking Mother: BIG NEWS!!! Hooray! I know exactly how exciting that is, so I'll do the happy dance with you! How are you feeling? I just saw you said you thought you might have GD -- I hope not! Hope you're feeling better every day! We found out on Friday we're having a girl -- yippee! That IS exciting! Way to go Aaron!! I know exactly how you're feeling! 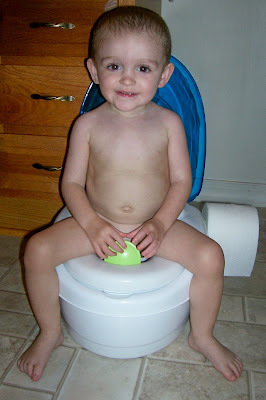 I can still remember the first time all of my kids peed in the potty and the oldest is 18, the youngest 11. No more diapers, hurray!!!!! I bet Aaron was really proud of himself, too! Congrats!!! !